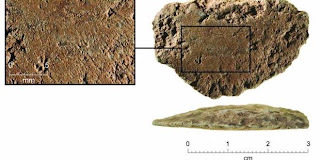 A group of archaeologists found a stone ax was about 35.500 years in Amhem Land, an area of 97.000 square kilometers located in the north of Darwin, Australia and an Aboriginal sacred land. Ax found in a type of edge ground axes, namely the type ax sharpened so that the edges sharper. Ax is claimed is a kind of edge ground axes of the oldest, defeated a similar hatchet between 20000-30000 year-old found in Japan and other parts of Australia before. Bruno David, Monash University scientists who discovered these axes explain the evidence that the hatchet is a ground edge. "We can see the sign at the edge of the ax. People who use it mengasahnya hatchet with stone so that its surface is more subtle," said David as reported by the Discovery site on Friday (5/11/10) last. David said that the findings could undermine the view that the hatchet came from Europe. "The meaning of this discovery is that we can know that the conventional view that states ax comes from Europe does not apply globally. We must think differently," he explained. In addition, this study also could be evidence that the Aborigines who inhabited the region Jawoyn has developed technologies that support life. "Grinding stones indicate the existence of technologies that increase efficiency. The discovery of this technology is equivalent to finding a bow and arrow," David said. Members of the Aborigines who had invited the archaeologists to the holy land, said the study could open a very significant relationship with the ancestors. "I want to know the truth (about the stone ax). Now I already knew it. I feel happy," said Margaret Katherine, landowners in Amhem Land. Live Link Will Be Deleted! Eggs Can Swim Are You Sure..? Solar Panel on Space, Is it Possible? What is Merapi Lava Dome ? What is "Wedhus Gembel" ? Dust and Vulcanic Sand Very Profitable. 2010 All Rights Reserved Budak Banten.